This article is primarily about arrogant atheists, but there are also arrogant agnostics who side with them when maligning Christians. (Yes, I know that there are subdivisions of atheist and agnostic beliefs, but those strike me as arbitrary and inconsistent. The kind of agnostic that says, "I don't know if there is a God, but I'm open to the possibility" seems to be harder to find.) Some can't make up their minds if they're atheist or agnostic, flip-flopping between the two positions, but still delight in attacking Christians — especially biblical creationists. 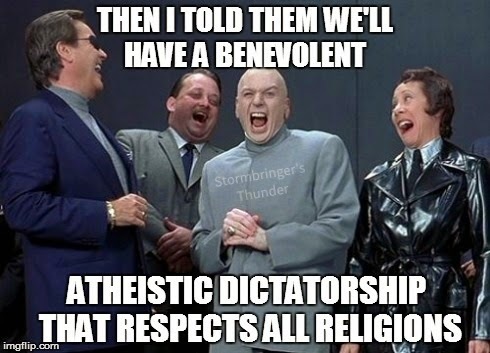 When you wander into territory on the Web controlled by atheists, you'll invariably find posts by tinhorns who think they're geniuses because they are raising things about the Bible that they consider contradictions (which have been answered time and again for centuries), items that they reckon to be unfair (based on taking things out of context and subjecting them to their personal, uninformed biases), hasty generalizations (finding a religious person that is crazy as a loon or a Mohammedan murder, and using that to demonize "religion" as a whole), vilifying creationists in forums and Weblog comments, and so on. Watch for how so many act like they're heroes, saving the world from Christians and creationists. Then they have a festival of self-congratulations with others who are stupidified by hate. In an article that dealt with a question from an "agnostic" at Creation Ministries International, someone said, "Your logic is great and this supreme creator logic indeed fits the bill on how universe was created. However, you are failing to see one point". Really? Somehow, you are the only one to point this out to a ministry that has provided thousands of articles on creation science and apologetics? Not hardly! In a subsequent letter, the "agnostic" showed his true colors. See "Answering agnostic arguments" for both questions and responses. In my last article, I was attacked by Ashley Haworth-Roberts after I repeatedly showed his bigotry and incompetence in using logic. Replying further bad reasoning, he used abusive ad hominems, the appeal to motive fallacy, cherry-picking, and more. He furiously said, "Go to hell liar Sorensen." Later, he posted a link to his Forum of Futility and added, "Go to hell liar Sorensen. The link showed that you are LYING. And you will censor this because you are a LYING s**t." (Does his atheistic "morality" require him to curse with asterisks? Weird.) He complained that I refused to post a forum link that he furnished, but I had linked to that forum twice in that article alone (I've done so in other posts as well), and even suggested that people to search them, as documented in this video. Apparently, people aren't clever enough to check things out for themselves, so he has to lead them by the nose. The hypocritical Freedom From Religion Foundation is attacking Christianity at every turn. They put up billboards mocking Christianity, protest giving away Bibles in public schools, and many other affronts to Christian life and practice. Interesting, when schools have events where Islam is promoted, you won't hear nary a peep from them. Liberal "Christians" join forces with Americans United for Separation of Church and State to protest the "Ark Encounter" of Answers in Genesis. News flash, old son, there is no "Constitutional separation of church and state". Don't believe me? Read the First Amendment yourself. There are many other examples of atheistic bigotry that we read about in the news. Then they wonder why people don't like them. When creationists present scientific and biblical arguments for creation and refuting evolution, evolutionists come along and demand "equal time". They claim that people cannot make intelligent decisions unless they get both sides of the story. I've got some bad news for you, Sunshine, we are "equal time". 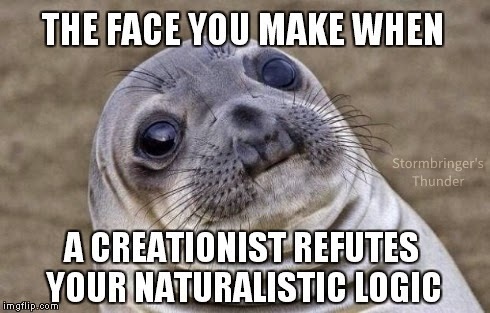 Evolutionists and atheistic naturalists dominate the discussions, and our sides is not given accurate representation. We don't have to give you a platform on our sites, Pages, groups, or whatever. These people appear to think that everyone else are mindless sheep, and secularists need to save us from ourselves. What they don't realize is that we are promoting critical thinking and logic, and many people do think for themselves. Atheism and evolutionism do not tolerate scrutiny. Although these sidewinders want to appear that they are fighting for fairness and justice, it is thinly-disguised bigotry and attempting to further persecute Christians and creationists. To quote Bill "I'm Not A Scientist But I Play One On Television" Nye, "I find this troubling". For Haywire's abuse and spam, this fits. His whining is all about his ego and has nothing to do with the facts in the article. How can something be "behind your back" on a Weblog, genius? And as I said elsewhere (but you persist on repeating your logical fallacies), "...that he probably hoped I would not read". That's darn near the appeal to motive fallacy (which you invoke many times, in addition to your blatant libel and lies). Also, it's just plain stupid. I know you stalk me, you know you stalk me, I put something (a) on a Weblog for the world to see (that's what they're for, genius), (b) I announced it on Twitter, Google Plus, Facebook (our Page has over 4,455 "Likes"), (c) other people have shared my posts. Get a life. How about if you complain about Popular Science? They stopped allowing comments. Oh, horrors! CENSORSHIP! Yaaaaaaaa!